For the characterization of archaeological ceramics, the study of thin sections under the polarizing microscope is a very efficient analytical technique. There are two properties of ceramics which can be analysed by thin sections, namely the mineralogical composition and the fabric. Both features show a considerable variety which permits a very detailed description of ceramic wares. With respect to the mineralogical composition, there is a wide variety of rock forming minerals, of heavy and ore minerals, fragments of stone, fossils, organic inclusions like straw or pieces of charcoal as well as artificial inclusions like slag or crushed pottery, which define with the temper of the pottery in much detail. The fabric also shows considerable differences in grain size, in the amount of temper, in the orientation of grains and other features, which provide further quantitative data on the properties of archaeological ceramics. From this information, the material can be well characterised, and conclusions as to the region of origin and the potter's techniques can often be drawn. Ceramic finds from the Galería de las Ofrendas at Chavín de Huántar were characterised by combining the classification by archaeological typology with archaeometric results of studies using neutron activation analysis, Mössbauer spectroscopy, X-ray diffraction and thin section microscopy. These analyses show that the vessels were made from different raw materials and by different firing procedures. 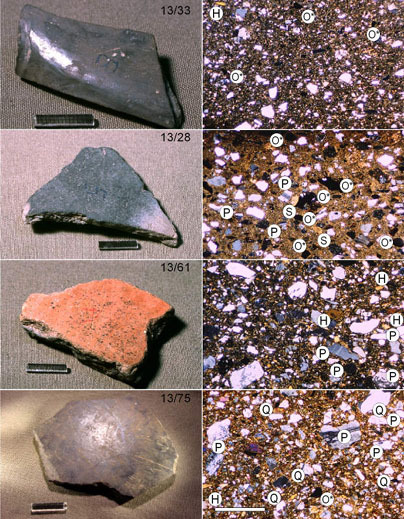 Sherds of certain styles largely exhibit similar types of Mössbauer patterns and similar element compositions, but no similarity with local material was observed. This supports the archaeological notion that the vessels found in the Galería de las Ofrendas were brought to Chavín from the provinces, perhaps on the occasion of a festivity. The applied methods compliment each other well and yield an altogether satisfactory classification based on different material properties. It becomes obvious that the finds from the Galería de las Ofrendas are not of local production but were brought to Chavín from the neighbouring provinces, presumably as offerings, be it on the occasion of a single festivity or over a longer period of time. Neutron activation analysis also shows that ceramics with very similar element composition as that of finds from the Galería de las Ofrendas are also found in the settlement of Chavín. This is most obvious for Floral black style pots, of which only one was found in the Galería. Ten more sherds were encountered as surface finds in the settlement of Chavín and were studied in this work. This observation does, however, not necessarily conflict with the notion that the ceramics from the Galería de las Ofrendas were initially brought to Chavín as offerings, since local residents may have used some of the offerings in their daily life. 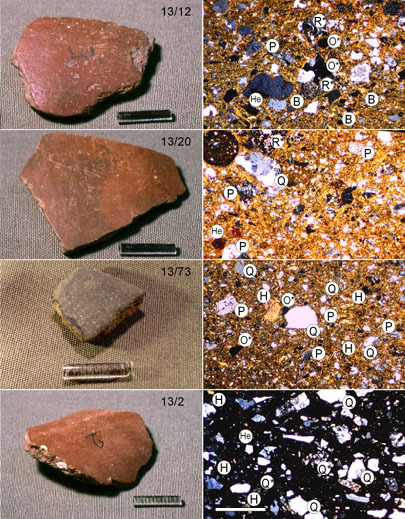 Characteristic thin section micrographs (right) of sherds (left) from the Galería de las Ofrendas. The numbers in the plots are the numbers under which the sherds are registered in the Munich database. The dominant minerals are plagioclase (P), quartz (Q), hornblende (H), biotite (B), rocks with different inclusions (R*), opaque ore (O*) and hematite (He). The scale bar is 1 cm on the left and 1 mm on the right.